IGT take the admiral of Chinese Ming Dynasty as the leading character of their new pokie. Zheng He was the diplomat and explorer who was credited to have found the American continent long before Columbus. Actually it happened in 1421 which is probably the reason for the title of this video pokie. This brave sailor and explorer will take you on his ship and use his maps to find the top prize held by this spinner. You stand to win a multiplier of over 100 times your stake, or Free Spins with active multipliers added to them. This 5 reel 88 payline pokie is available only on desktop, so you won’t be able to take it with you, but even so it is worth taking a closer look. Finally we have a Chinese-themed pokie that has a storyline and actually makes sense. Another pokie also revolving around a historical person from Chinese culture is Microgaming’s Huangdi The Yellow Emperor. IGT lends the image of famous sailor and explorer Zheng He, who also acts as one of the symbols on the reels and pays quite generously 500 for five of a kind. However, some typical Chinese customs are still present such as the fact that the highest paying symbol, the Wild pays a symbolic amount of 888 times your stake, as any combination with number eight in China is considered fortunate. What we liked the most in this pokie is, first of all, the fact that there are four different bonus games and second of all, the fact that we could choose which one to play. Involving the players is always a good idea so this is one big plus for 1421 Voyages of Zheng He Pokie. The available bonus games include Cup feature and three different combos of Free Spins and multipliers. The Cup feature is the most volatile one as one of the three cups hides the 102x multiplier, while the Free Spins offer three variations: 20 spins and a random multiplier which can go up to 3x, 15 free spins and a multiplier up to 5x and finally 10 free spins and a multiplier up to 8x. The fact that you can choose which game to play gives you some control and a chance to perhaps use a strategy if you are that kind of a player. Definitely our main complaint about the 1421 Voyages of Zheng He pokie is the narrow betting margin which ranges from $0.88 to $4.40 which is pretty low and won’t attract high rollers or those who enjoy the risk of big stakes. Another thing that did not appeal to us was the music, which is too loud and irritating. Still this is one problem that is easily solved. 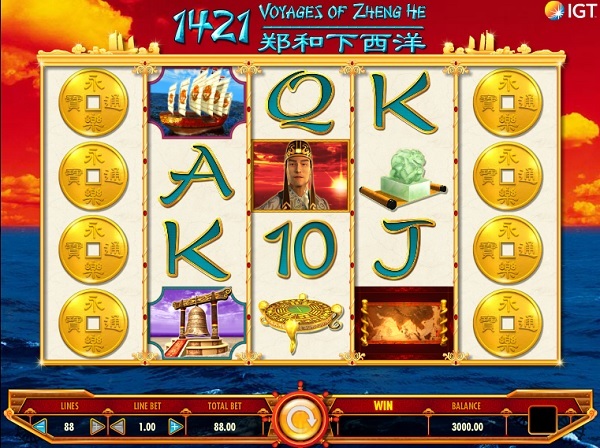 1421 Voyages of Zheng He is definitely an interesting and dynamic video pokie that immerses players in the story and lets them take part in the action. All of the bonus features are both attractive and lucrative which only adds to the excitement as you pick the right one. Though the maximum bet is limited to only $4.40, this voyage through Chinese history could pay nicely and you will definitely have fun.